One of the first steps in starting an RIA firm is to become properly registered as a Registered Investment Advisor (RIA) firm. The RIA registration process is administered at either the SEC or state jurisdiction level. FINRA does not have any regulatory authority over RIAs, but it does administer the online application system for the registration of RIAs and their investment advisor representatives. While there are some exceptions, in general, investment advisors who start an RIA firm with $100 million or greater in assets under management (AUM) must register with the SEC as Registered Investment Advisor (RIA). 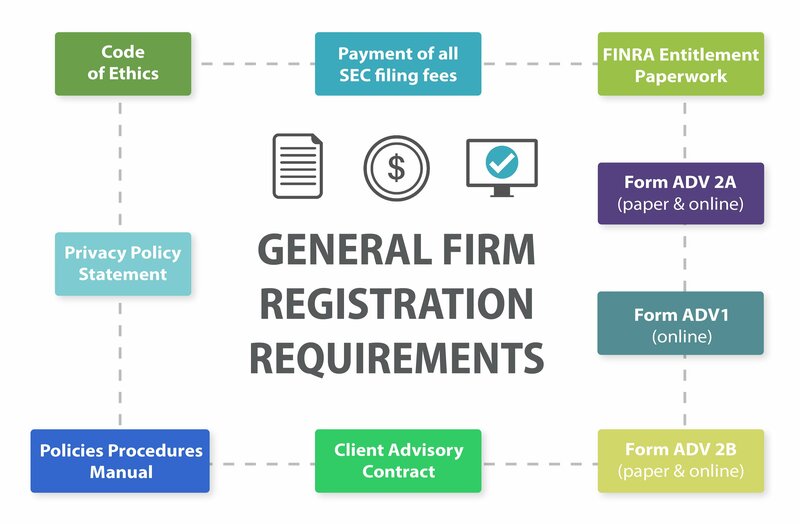 For a list of some of the common exceptions which allow an investment advisor with less than $100 million in AUM to register with the SEC, check out the SEC Investment Advisor Registration Overview. Exceptions aside, prospective RIA firms who start an RIA with less than $100 million in AUM must generally register with the relevant state(s). In general, an RIA subject to state registration must register in any state in which it has a physical location, a representative physically located there, has 5 or more clients (or a single client in the states of Texas and Louisiana), or is physically soliciting in that state. Do keep in mind that there are some exceptions to these general guidelines. Each state’s registration process is also unique to the individual state. For a directory of each state’s RIA registration requirements, check out the Investment Advisor State Registration Directory. Administered at the state level. In order to file a registered investment advisor application with the SEC or a state, one must first apply to the Financial Industry Regulatory Authority (FINRA) for an account (Entitlement) to their WebCRD/IARD on-line system (the web application for the registration of RIAs and their representatives). While RIA’s are in no way regulated or supervised by FINRA, the SEC and states use FINRA’s WebCRD/IARD system to process applications. The Form ADV Part 1 is the online component to your Firm’s registration documentation. Note: The Form ADV Part 1 primarily discloses information about the Firm. Individual information is primarily disclosed in the Form U4 as detailed below. The Form ADV Part 1 is also the vehicle to upload your Firm’s Form ADV Part 2A (Firm Brochure) and Form ADV Part 2B’s (Brochure Supplements). The Form ADV Part 2A acts as your Firm’s Brochure. It is a narrative description of your services, fees, disciplinary disclosures, as well as several other Firm details. The Form ADV Part 2A must be provided to all Clients and Prospective Clients. The SEC and states require that the ADV Form 2A be written in “plain English” and easily understood by your clients. Client Advisory Contract including an investment policy statement that meets the appropriate regulatory authority standards for client advisory contracts. The firm’s Policies and Procedures manual is the guiding document that your firm will use to maintain and enforce your firm’s internal policies on all aspects of your business from the handling of client complaints to the training of new Investment Advisor Representatives. It also houses your Firm’s Business Continuity Plan, Anti-money Laundering Policy, and Anti-insider Trading Policy. Code of Ethics filing ensuring that you meet the standards of the SEC or state(s). Over 3,500 investment advisors have trusted RIA in a Box as their registration compliance consultants and our mission is to enable fellow entrepreneurs to establish their own RIA firms and remain in constant compliance with regulatory guidelines. RIA in a Box is the fastest, most efficient way to set up your advisory firm with the SEC and we also offer on-going monthly compliance services packages beginning at $250 per month. We are staffed by ex-regulators and believe we offer incredible value that can’t be matched.